Blucher was resting at a convent some distance from Schottenstein when reports came in about Adelsdorf. With Augereau only some thirty miles to the south and vulnerable, it seemed a good idea to head that way and hopefully crush the marshal between the two allied armies. Orders were thus written. Ney's grapevine was more active. Well informed of his fellow marshals immediate danger the previous night, Ney left Coburg in the early hours and proceeded south in a hurry. By dawn he was already at Rossach. The French plan was simple; a token bombardment and a swift attack. Most troops crossed at Rossach and headed south to Puchitz and then west towards the twin bridges. 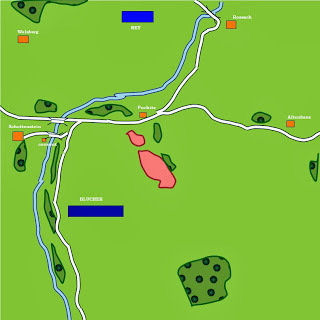 Sicard's brigade was ordered to stay and cover the crossing at Rossach. Blucher had to counter his own orders so there was some initial confusion and inactivity despite this new and alarming threat. Aside from the guard, most of his corps was stretched out on the plains south and across the river from his HQ. 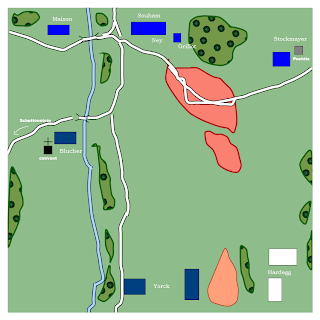 An Austrian force of some 5,000 men under general Riese was ordered on a flanking march east to Altenbanz and then north to Rossach. Without hindsight this was a good move. Some scenes at the convent, prior to the attack.. The garde du corps crossed the river and paid a brief visit to Yorck but soon returned to the convent when the shells started to fall.. The French began a general cannonade along the entire line. Ney, at the head of some cavalry is one of the first on the field. Stockmayer has safely set up around Puchitz and Maison crosses the northern most bridge to threaten Blucher. Audacity, Ney thought, is the key to victory here. Without a second thought he's off! Charging at full gallop at the head of a squadron of cuirassiers with three chasseur squadrons caught up in it (most of the cavalry hadn't arrived yet), Yorck is as surprised as Souham! And it nearly worked! Prussian morale was shaky at first but held up in the end. Guns were abandoned and then re-manned. With the smoke and noise of it all it really seemed to the Prussians that a whole cavalry corps was upon them. After the initial shock uhlans were encouraged to chase the French off. For some of the chasseurs it was too late. Two squadrons were completely destroyed, the third lost nearly half of it's men (120) but made it back to relative safety. The marshal himself was very lucky to have survived and the armoured troopers surrounding him didn't come off that bad losing only 40 out of 200. Marshal Ney heading towards glory! The last wave of chasseurs about to hit home. The remnants of which had a time of it getting back to safety and had to take an alternative route back. Chased by lancers and then cuirassiers and stumbling up and down hills and through murderous squares of infantry, they were the lucky ones! As Ney makes it back to re-group, Souham's infantry, many of them veterans, stop the Prussians and force them onto the defensive. Yorck's line barely moves now for the next couple of hours due to reports getting lost or arriving too late. The French in the centre like to keep it that way, at least for now. Both wings by now are starting to feel some heat, particularly the Puchitz sector. Here fighting started with the Austrians taking on Polish troops outside of the walls. Stockmayer sends his own countrymen (4th, 5th & 6th Wurttemberg regts) to the hills south-west of his lines to counter an attack from that sector from the Prussians. Sure enough this turned out to be a good move. General Maison's brigade makes it across the northern bridge as Ney's initial and foolish charge hits home. The Frenchman is slow and methodical, straightening the lines some distance from the enemy, but easy targets for Prussian gunners. Under shot and shell these men stood for half an hour, grumbling, and dying. A request was sent for cavalry support, hopefully they would arrive at the crucial point. 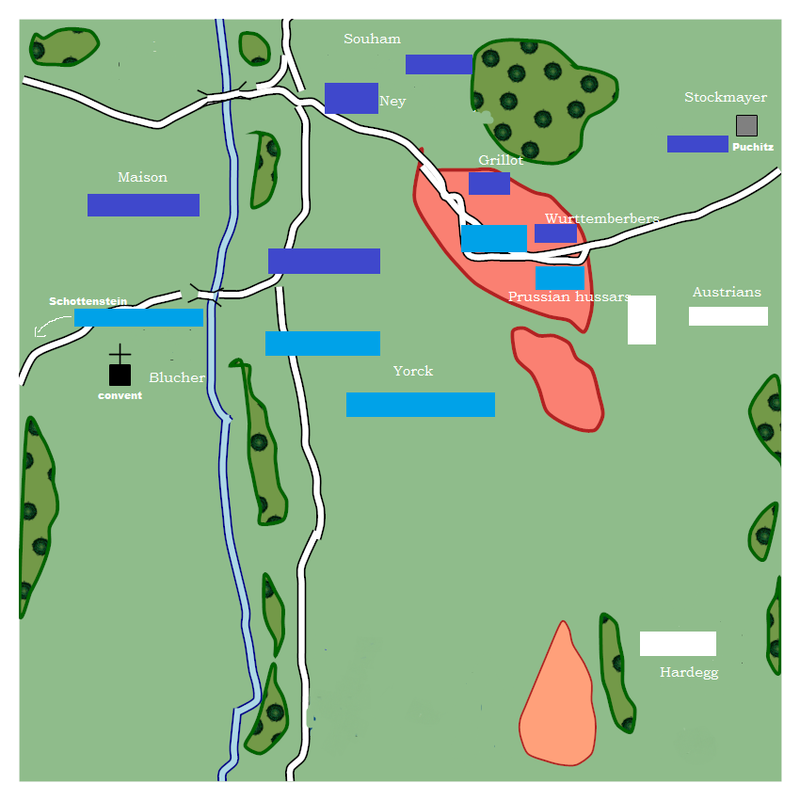 His six battalions (2 line, 2 light & 2 Saxon) somewhat reduced already, finally set out towards their goal. ...but his Wurttemburgers are hotly engaged. Supported by some of Grillot's Frenchmen, they at least for now hold their ground. French artillery slackened for a bit leaving these guardsmen - at least on the face of it - to enjoy some nice weather! By now the centre was hotting up again. Prussians started to gradually edge forwards as musketry opened up across a massive front. At one point the French were close enough to shout their obscenities, frustrated as they were at being left on their own without cavalry support. Ney was busy gathering as many troopers as he could find for a series of lightning attacks but Souham's infantry suffered some heavy casualties in the meantime. The battle here raged on for another hour or so. Men were being killed and maimed left, right & centre. 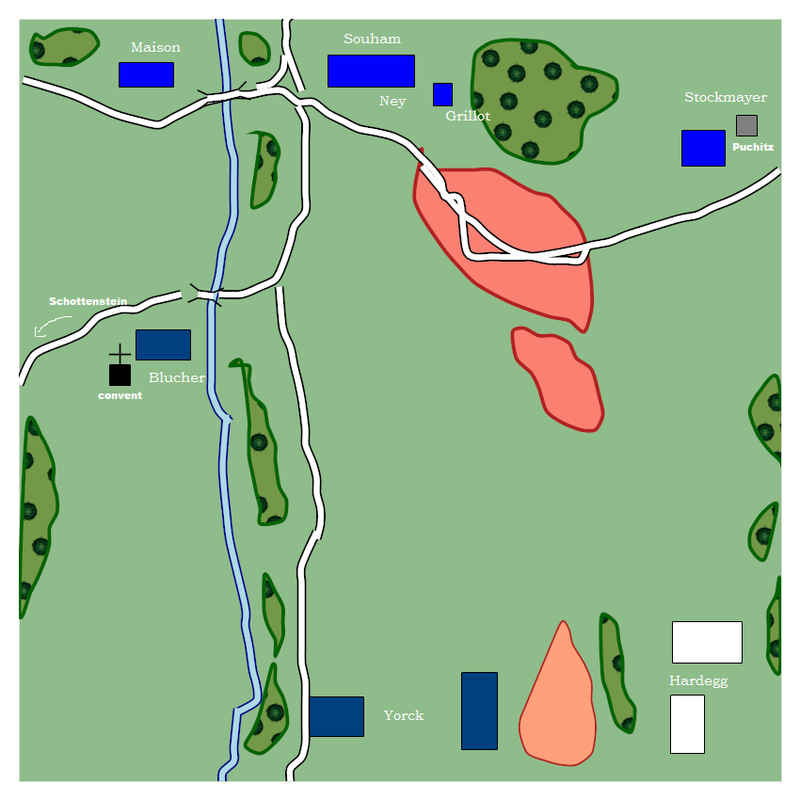 A Prussian reserve unit was routed after a bayonet charge, or the threat of one at least. No units got that far, but instead stood firmly and resolutely on their ground. The scene by now on the Prussian right saw a lot of action on the heights. French and Wurttembergers struggle against a series of infantry and cavalry attacks. Grillot's infantry take a Prussian unit in the flank capturing it's flag and causing it to flee with heavy losses. The Wurttembergers take many casualties too and slowly start melting away. It's getting tight here for the French, with both Souham and Ney ignorant of the fact! An Austrian cuirassier regt is ordered west across some hilly terrain to support the Prussian cavalry but becomes disordered after wrong footing a steep bank (I have special dice for this kind of thing) and suffering some casualties. The 5th seen here fighting off hussars and infantry during Yorck's main offensive. The steepness of the hill is clearly visible here and played a vital role. Meanwhile General Maison's men have gained ground enough for them to reply to the artillerymen in kind. As gunners fall under heavy musket volleys and start abandoning their instruments of death, some are re-assured at the sight of Blucher extolling his grenadiers. The guardsmen started taking casualties though and the cavalry was mustered. The Saxons in the centre were falling like flies through the smoke and the noise. It got shaky, no sight yet of that cavalry support their morale was tested again and again. The French columns didn't falter despite losses, and credit to them for standing up to such mighty men of the Prussian guard. The ground was shaking when I managed to climb a hill and take this shot of some of the action! The situation on the Prussian left and centre was becoming dangerous. After numerous enemy cavalry attacks and with good infantry support Yorck had to make some quick decisions. The French heavies had scattered the hussars, inflicted casualties amongst the dragoon regt who bravely stood their ground, and his cuirassiers were chased off after being caught in the flank by uhlans. These cuirassiers were stuck between a rock and a hard place and were forced to flee past Souham's infantry battalions in line. The scene became one of slaughter as men and horses fell right in front of their own hapless infantry. It was only after this incident the uhlans got their orders to support Maison's brigade on the right. At the convent Blucher was blaming Yorck for not covering the bridges and cursed the sky with the noise and chaos around him. His grenadiers were suffering heavy casualties and his cavalry were now fully committed. With the French seeing their lancers at the crossing some way behind them their hearts stiffened and they put up a good fight with the guard cavalry. The carabiniers suffered the worst, being literally ridden over with muskets and shakos flying everywhere! With his guard now reduced to almost half it's effectives, Blucher was forced to abandon the position in a hurry taking with him the 1st battalion and leaving the rest to cover for as long as they could. Over on the Prussian right things were more stable with Hardegg using all his resources well to keep the French pinned. Prussian lancers managed to decimate a Polish square. No rumours about the situation on the left had reached him yet. In time the French soon became masters of the heights despite losses, and the remaining Wurttembergers made it back down and into Puchitz leaving Grillot's forces to march across the heights to out-flank the Austrians. 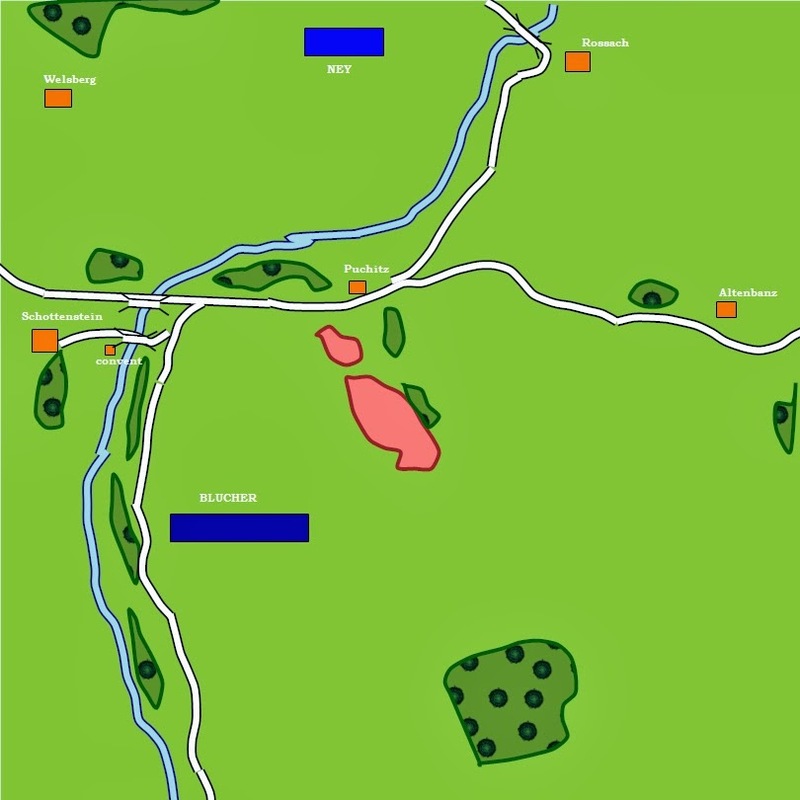 In the centre Yorck's units after taking many casualties started melting away one by one until it got to a point when he was forced to issue a general order of withdrawal. Having heard nothing from general Riese all day or indeed Blucher, and having lost most of his cavalry and half his guns, he had the remaining dragoons and uhlans to cover him. The fighting around Puchitz fizzled out before a French flank attack came to fruition, with Hardegg leaving the exhausted Poles & Germans surrounded with their dead and wounded. Ney, elated and on his second horse rode over to the convent. The French in the centre were exhausted too after the nights march and all that fighting, so there would be no pursuit, most of the cavalry being blown anyway. Blucher and his army headed south to Mursbach. Sicard and Riese took no part in the fighting and left each other alone in a kind of stand-off. They were off-board anyway, and with a lack of time I decided it on a dice roll. Losses on both sides were quite heavy. The Prussian guard lost a third of it's strength, the cuirassiers lost a hundred men and some line battalions were reduced by half. The artillery was no better off. Estimates of allied casualties number around 4,600 including prisoners of which there weren't many. Ney had nothing to laugh about, the French lost 3,500 or so with big gaps now in his German allied infantry. Losses in heavy cavalry were reasonable considering the amount of attacks they went through. The Saxon garde du corps came off well and did some heavy damage to the enemy infantry. His Polish units were much depleted, and his light cavalry (of which he was low on to start with) is now just a handful of scouting parties. Victory for the French then and a bit of a blow to the allies as it was Blucher's first encounter in the campaign. He certainly won't be bothering Augereau now, at least for the time being or until he receives reinforcements. A lot of luck played it's part for the French. Riese's absence for a start, and Prussian dispatches not getting through another vital factor. Some pics that never made it. Wonderful stuff - your figures, terrain and photos are superb as always, keep it coming! I'm confused, I didn't see that post...in fact, I didn't know your blog, I think you should put a link with your profile because this is an excellent post (shame to miss! ), I really like that kind of report, the mass effects on the pictures are really, really impressive...Beautiful work! Thanks for the advice Phil my friend and your kind words. To be honest, I have trouble with my blog at times. For instance, if I put up a photo by mistake I cannot delete it. In doing so it deletes the whole post! All by itself! ...There are other little glitches here and there...maybe it's me as I'm not that bright when it comes to computers! As far as I can see my blog is listed if you click on my name. And the best to you too. Thanks Ian, glad you enjoyed it.